Finally tested and approved this all 3d printed racing drone. 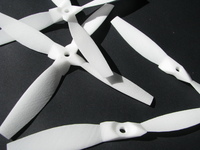 This construction is made for 2206 RacerStar motors (or any other 22mm motors), 32mm size FC and PDB and 4 separate ESCs. Whole body is connected with 3mm and 4mm screws and 4 nuts for 4mm screws used on arm to base connection. The Base part can be made from carbon fiber to add stiffnes and to prevent destroying the middle part while crash. For this case there is even a 3d model for mould that you can use for moulding carbon fiber. I will add here some photos of the moulding process when I have time for mould it.